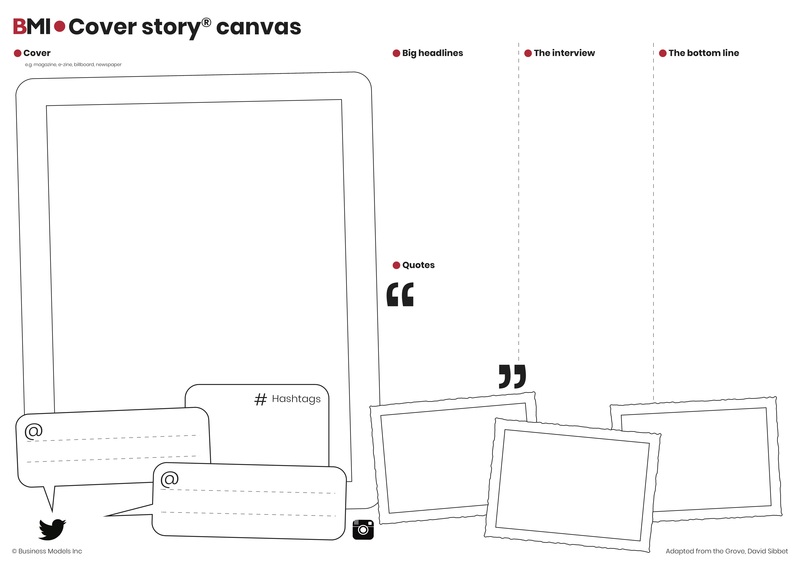 Business Models Inc. Cover Story Canvas, what is your story? What is the most amazing future you see for your company (and yourself)? Who has the boldest vision ever? Imagine how you will appear on magazine covers. What’s the word on the street? Creating a cover story will help you get into a future state of mind. The cover story canvas was created by David Sibbet, of the Grove International. The cover story canvas ® challenges you and your team to project yourselves in the future: how will the world respond to what you have accomplished at that time. Mind you, this tool will (probably) not provide you with a turnkey vision. But it will challenge you to think beyond the realm of the known and safe. Why else would there be a story about your company in one of the world’s bestselling magazines? This canvas will provide you with plenty of material you can use when formulating your actual vision. Furthermore, because it’s tactile and visual, the vision canvas will elicit tons of feedback. To get started, huddle as a team (or, even better, multiple teams) and have a thoughtful discussion about what magazine you’d like to be featured in once you’ve achieved your vision. It’s important to have this conversation, as the tone, voice, and readership of the particular magazine make a big difference. Whatever you decide on, you’ll find this conversation fun and stimulating. Once you’ve decided on your magazine, move on to the headline. What are the biggest, most inspirational headlines you can think of? How are you changing the world (or at least your organization) with your idea? This article will talk about your major achievement, but will also recount the story of where you started and how you got to your a-ha moment. What’s the bottom line, the facts, and figures that support the headline? Capture those as well. As in any magazine article, there’s going to be some kind of interview component. What questions will be asked? How will you answer? How will your skeptics show up? What are people saying on social media? Now comes the fun part! Draw your story. Magazines are very visual. Make your magazine cover story visual as well. Who or what’s on the cover? How will this grab the reader (i.e., your team)? Have a discussion with the group about the year you’re designing the story for as well as the magazine. Is it 5 years from now? 20 years? And choose the magazine. In fact, the magazine, in this case, is very important. The group should discuss why one magazine over another. Could it be Wired? Time Magazine? An industry magazine? A newspaper? Write these on sticky notes! Now that you have defined a year in the future and your publication, it is time to come up with the cover. Use the template to come up with headlines, quotes, and anecdotes. What else is going on in the world? What is the story that captivates the magazine’s audience? Why? Finally, draw the picture that will be on the front! When you’re done with your cover story, everyone in your group should be pretty jazzed about the future of your idea. We mean, this is the best future you all can imagine, right?! Now it’s time to make it more concrete and validate it with others. Let us help you working with the best tools.